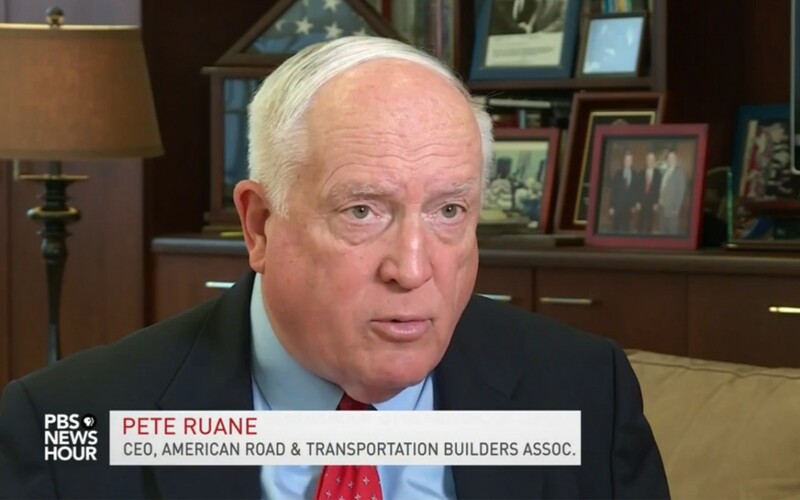 ARTBA President and CEO Pete Ruane was featured on a Dec. 30 segment of the nationally televised PBS Newshour. The story looked at Congress’ accomplishments in 2015, including the Fixing America’s Surface Transportation (FAST) Act. The five-year, $305 billion surface transportation law passed both houses of Congress by wide margins, despite continued partisan rancor and unexpected developments like the resignation of House Speaker John Boehner (R-Ohio). Immediately following passage of the FAST Act on Dec. 3, Ruane praised Congress in a statement, but he also noted that Capitol Hill and the White House had sidestepped a golden opportunity to put the federal Highway Trust Fund back on solid financial footing with a long-term, permanent revenue solution. That will be a major focus of ARTBA’s work in 2016. Ruane also warned that the FAST Act falls short of providing the level of investment that would result in demonstrable improvement in the overall physical conditions, performance and safety of the system.